Zech is rooted in the natural world that inspires him; his atelier - a year- round campsite devoid of house and heating but equipped with power and water - sits at the edge of Germany`s Black Forest, where he has been living and working since 1995. Zech discovers his bowl shapes inside the trunks of trees cut down due to disease, age, or weather damage. Some of them are 300 years old, and he sees giving the trees new life in bowl form as a way of reviving the strength, energy, and majesty they once possessed. 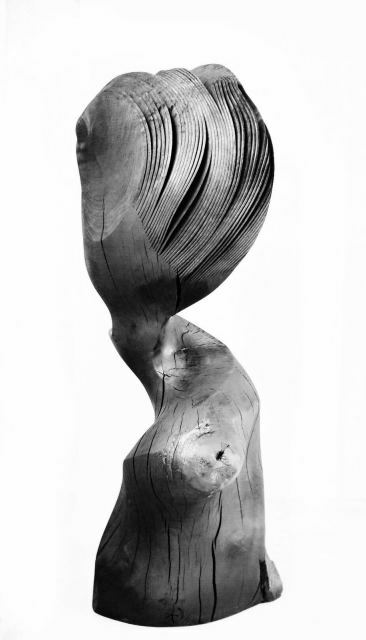 Zech`s largest piece, made from a single block of oak and measuring 51 inches in diameter by 31 inches high, represents a natural progression from the oversized orbs he previously sculpted.